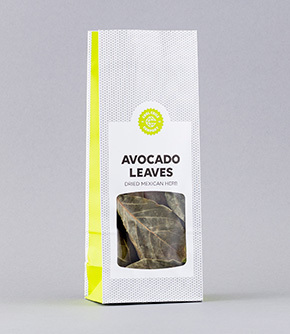 Aromatic dried Avocado Leaves are only from native Mexican avocado trees. A popular herb throughout central and southern México with a subtle anise flavour, Avocado Leaves are toasted to release their natural oils and often used to enhance barbacoas (a particular way of cooking meat), black beans, guacamole, moles, pipiáns (a type of mole made with pumpkin seeds), soups, stews, and tamales. In a spice grinder or a molcajete (pestle and mortar), grind toasted Avocado Leaves until powder-like, then sift into guacamole. You could also lay a bed of avocado leaves on a soaked dried Corn Husk, place a fish fillet on top with achiote seasoned butter, then wrap the husk over on itself so the fish is enclosed and roast in the oven until cooked through. Toast leaves in a hot, dry pan for a few seconds on each side. Add whole, like a bay leaf, to soups, sauces, stews, rice or black beans, or tuck under roasting meats or fish.